Steampunk explores an imaginary Victorian Era where the sun never set because it’s always tea–time. The steampunk aesthetic is stylish, retro, and inventively vintage. Free UK shipping for all items. Compact folding binoculars with integrated compass. The adventurers friend. Small bell jar with vintage style glass. 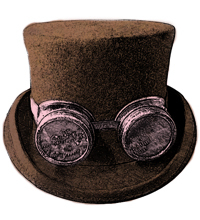 Steampunk goggles. Brass or silver coloured goggles available. Brass opera glasses. Solid and stylish with impressive magnification for their size. Unusual sundial compass with bubble gauge for precise alignment. Three laboratory style 250ml serving flasks. Trusty compass with metal carrying case. Spherical pocket watch with wing adornments. Equipped with a necklace chain. The pocket watch for the explorer (international adventurer or idle flaneur). Russian traditional Podstakannik tea glass. Spring into action with this unusual folding magnifying monocle. Eye-catching cog adorned pocket watch. Brass pocket telescope. A compact spyglass for easy concealment. Vintage style pocket watch with Quartz action. Invaluable tool for explorers, dashing young officers, and rogueish pirates. The essential tool of detectives, antiquarians, and others on the trail of hidden secrets. A tentacular adornment for steampunk pirates, and Nautilus submariners. High-quality black bamboo and lace fan. Nothing adds an air of professorial reassurance and gravitas quite like a pipe. High-quality white bamboo and lace fan. Beautiful handmade cravats courtesy of The Elusive Tie Maker. Elegant velvet choker with hanging cameo. Simple velvet choker with cameo and single black drop-bead. Ornate cameo necklace. Lace collar with draped stones and fine-wrought metal chains. Ornate gothic black gem necklace. Lace collar with draped stones and fine-wrought metal chains. Black lace cuff with linked companion ring. Ten 15mm bronze buttons with a crown design.